On 15th February we rehomed a dog from DogsTrust, a UK charity for rehoming unwanted dogs. We met him about two weeks previously and had visited several times to take him for walks and play with him. 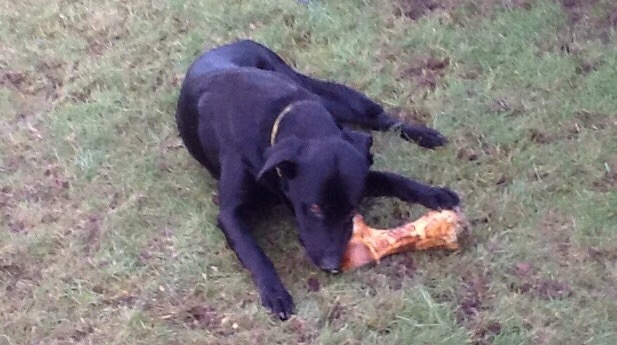 Sparky is a two year old labrador/collie crossbreed and so has plenty of energy for chase and fetch games. He has settled in well with us, as described in his regular Facebook posts, collected below. How to train your humans, by Sparky the clever. Now young puppies, listen to me. If you find yourself in the “A dog is only for Christmas” place, this is what you do to get some pet humans. When they come looking around, pretend to be asleep. If they won’t go away, put on the big sad brown eyes. One of your pet humans will then come and fetch you to play with the new ones. Jump all over them and look happy. They will then harness a human to you and let you drag them around a field. Occasionally slow down and walk properly – they like that. This might happen several times. Sometimes they will want to keep throwing a ball. You can bring it back if you like, but if you do they will only keep throwing it away and they never get bored of this silly game. When you can’t take it any longer, lie down and ignore them. You could try destroying the ball if you feel up to it. One day they will come and take you to their own kennel. I will tell you what happened to me. They put me in a big noisy car and we went on and on for ever. I found that if I squeaked a bit they would go “Blah blah blah Sparky blah blah blah”. This helped pass the time and helped me forget I was bursting for a pee. Eventually we came to a house and they took me into a garden. I ran around and made sure that every bush was marked as Sparky’s property. Then I went and did a poo on their patio. They said “blah blah” in the way humans bark when they are happy. After ages and ages playing the silly throw away and bring back game they put some dinner in a bowl for me. I pretended I did not like it to worry them. I saved it up and ate it after my evening poo just to worry them some more. Then the old whiskery one took me out to pull him around the streets. I made sure that all the trees were marked as mine, even when I had nearly run out of wee. After that I was tired and the soft one let me use the settee. I let her keep the bit under my head. I slept for most of the evening, then they turned all the dark on and said “blah blah blah Sparky blah blah outside blah blah business”. So I ran round the garden and peed on all the bushes again. Then they left me in the Sparky-can-plaster-mud-everywhere room and went away to the where-humans-go. The whiskery one said “blah blah bed blah blah” but there was only a clean-smelling fluffy thing in a plastic basket and another sheep-covering looking thing that I found was full of white fluff and not sheep at all. I played at pulling it apart for a bit, but then my humans had not come back so I shouted for them. The whiskery human had gone through a little gate, but I couldn’t work the catch, so I pulled it off the wall with a big crash. He came back then, so I jumped all over him and licked him lots and lots. He built the gate again and wanted to go away but I tried to get over it and then sat on the floor beside it and cried. He sat down on the floor too and said a lot of “blah blah blah” stuff.then he moved my basket near the gate. Suddenly he went away and came back with two nice old blankets. He put one in my basket and the other on my torn up sheepy mat on the other side of the gate. We both curled up on our blankets, but I made sure I opened one eye every time he moved, to check he was sure about the “not just for Christmas” thing. By the morning I had had a lovely sleep, but he looked tired when I took him for a drag. He said “blah blah too old to be kipping on floors”. We went out in the car today and I got some time to myself, but not too long, while they bought new things for me. Then we went to the woods and I taught the whiskery one how to run between trees on a long lead. He does not run very fast and gets tangled up a lot. Now it’s settee time again with the soft one. I think I like this home – mostly. How to train your humans. Day more than one, by Sparky the clever. Last night Daddy Whiskers (I found out his name) wanted to sleep in his own bed with Mummy Chrissy (I know her name too). So they looked at some papers and then moved my bed-cage to just outside the room-where-they-snore. We all had a lovely night asleep. In the morning I played fetchball with Daddy Whiskers and he made happy noises when I did “fetch-give-sit-stay-fetch”. Humans are easy to please. But I got a bit what He called “boy’s-truss” and my poorly paw that I cut in the garden began to bleed again, so I ran around on the lovely beige carpet until They noticed. Daddy Whiskers popped me in my bed-cage for a well-deserved snooze and paw-lick while He crawled around the floor with some foamy stuff. He wasn’t cross, and said “blah blah blah meaning to clean it for ages”. If He likes that game I will see if I can bring in some mud from the garden for His carpet. Later we went out in the car to a place called Gree-Nam Com-Mun. There used to be wimmin and yanks here, but they have all gone now and with no yanks it smells like fresh cow now and not like cooked cow. I met lots of other dogs and they had all come from the “not just for christmas” home just like me. How do they get so many dogs? Then I found a tennis ball and we played football for lots and lots of kick-fetches. I did a big smelly poo right on top of a cow poo so that Daddy Whiskers did not know how much to put into the bag – teehee! One of Daddy’s friends told him that naughty humans sometimes put bad kill-doggy stuff in toys so we should be more careful. Now I am home and I have had my dinner so it must be time to play again. Mummy Chrissy has been very busy while I was out and keeps saying “wet paint” but I don’t really think she wants me to do it. I will save it for the bushes and trees. How to Train your Humans by Sparky the Clever. Day more than more than more than one. I think I have Him mostly trained now. He gets up early to let me out to the garden and then gets my breakfast ready. Then He says “blah blah blah coffee” and sits down, so I go and put my head in His lap and fetch my indoor ball. When He has played enough coffee-and-ball He fetches my harness and off we go out into the cold. Today we met some other dogs and I showed off by doing a poo in a holly bush and then kicking leaves over it. Daddy Whiskers had to use two bags, and He said something like “Ow. sucking lolly”. Now He has a poorly front paw too. Later we went in the car to the woods and I tied one of His legs to a tree with the long lead. He did look funny. He hasn’t learned yet that the room where I come in from the garden should be muddy. He keeps making the floor shiny and I have to bring in some more paw-marks. It’s quite easy because I have managed to get rid of quite a lot of the green stuff covering the garden. In the evening He goes to His armchair and sits with His eyes closed until bedtime. That’s when I can finally get some peace and quiet. I think Daddy Whiskers is almost ready. On our morning walk today I let Him unclip my lead. I went on ahead, but as soon as I was out of sight He got lonely and barked my name, so I ran back and gave Him lots of fuss. But we found a place where some naughty people had broken the lights on top of the peeing posts and there was glass everywhere. Bad humans! I had to wait quietly while Daddy Whiskers talked to his little magic picture toy about it. Day – oh, lots, but not quite a week. Today was a rainy day, so I could not make Daddy Whiskers play in the garden. Instead he wanted to play “Thank You” in the living room. All I had to do was pick up my indoor ball and pop it in is hand. The silly man kept hiding the ball under the table. Then I watched Him making His funny coats flat with a thing that He called a “no-sparky-hot”. It took a long time so I went to sleep in my bed. In the afternoon we went to the shops in the car to buy more things for me and on the way home we went to the “where-chrissy-works” to say hello to her friends. Someone had left food in a bucket beside their table but I was not allowed to eat it – bah! When she came home Mummy Chrissy gave me a new toy so I chewed it up and left bits all over the human’s eating room carpet for Daddy Whiskers to chase with his very-noisy-toy. Daddy Whiskers tells me that other humans like to read my news. Yesterday I started to follow Him wherever He went in the house, just to make sure He wasn’t doing anything dangerous. It’s a good job I did that because He is so careless that more-than-one times He nearly tripped over me. Yesterday evening He left the house for ever such a long time. Mummy Chrissy was with me, but I did miss Daddy Whiskers. When He came home Mummy and I were in our beds, but I got up and ran to give Him a great big hug. He likes my hugs. He has given them a name: “Down-Sparky”. He has a name for when I lick his face too. That is called: “Aah-geroff.” I am really learning the human barks very well. He has bought me a second wire kennel for the house because he says that carrying one to and from the car is “fkinevy”. I have ignored the new one. I prefer my blanket on the settee, or anywhere on the floor. We have been working at improving the back lawn by playing kick-fetch with my ball. Daddy Whiskers says it looks like a goal mouth after a wet season, but I don’t understand human kick-ball games. After our gardening sessions I have decided to let Him wipe my paws with a towel. That stops Him getting out His noisy toys to make the floor shiny. I met a new friend today. He is called Ben and he is like me but bigger, even if he’s younger. That’s because in the bits of me that are a little Welsh sheepdog he has big German sheepdog. He told me that he came from the “not just for Christmas” place too. We started to play “sniff-bum” until our leads got all tangled up, and that was funny to watch the humans trying to sort out. I am tired now, so I will find a not-in-the-kennel place to stretch out and have a sleep. Daddy Whiskers has been away a lot. I don’t know why but It was something about lots of grown-up men playing with toy soldiers. It means I had to play with Mummy Chrissy after breakfast every day. On our morning walk the other day I let Him off the lead for a while when we were on a muddy track in the woods. He couldn’t keep up and kept calling for me so I had to wait lots of times. I wish I had a younger pet. But yesterday when he was off the lead I played a trick. I saw a big field so I jumped across a stream and under the fence. He barked and barked but I didn’t go back because it was such fun. When I did go back He didn’t know whether to say Good Boy or Bad Boy. So today He wanted to stay on the lead in the woods. We used the very long lead and I tied it around my leg and pretended I was lame. We went shopping afterwards but only for Human stuff. I stayed in the car to guard it from the men who make cars clean with water. Today when we were walking we saw some funny birds. They didn’t fly, but they walked on more-than-one legs like humans. Daddy Whiskers said they were ducks. I thought they looked tasty, and He said they were, ‘specially with a norange. I would have fetched us one but He said “Sparky-no.” Humans are strange. We both wanted duck and it would have been easy to take one. Perhaps it was because I didn’t know where to find the norange. My two favourite games are indoor “roll-fetch” and garden “kick-fetch”. In the first one Daddy Whiskers rolls my squeaky ball across the carpet and I have to guess how it will bounce off the furniture. In the second one He kicks my tennis ball and sometimes it goes where He wants it to and then I have to find it in the hedge or somewhere else. Poor daffodils! I am getting so good at doing quick turns and skids on the grass that there is almost no grass now. I have learned that when I come back indoors I have to have all my paws wiped with a towel. Daddy Whiskers says I am so clever that He might take me to local bowling green for more practice. There I can make friends with all the other old men who will roll big balls for me to chase. Today it was very cold on the paws when I took Him for His morning walk. He found an old bit of wood and wanted to throw it away in a field. To keep the field tidy I kept bringing it back until it was in tiny bits and will not be a nuisance to the Humans when they play kick-ball in the field. On the way home I jumped into the stream, but it didn’t go “splash”, but “crack”. My, it was cold! I think Daddy Whiskers is poorly. I know that playing in the fresh air will make Him better, but when I try to explain by going to the back door and looking at my ball He says, “Dot Dow Sparky. We’ve dode that four tibes already.” And He keeps making nose noises into a big red cloth. 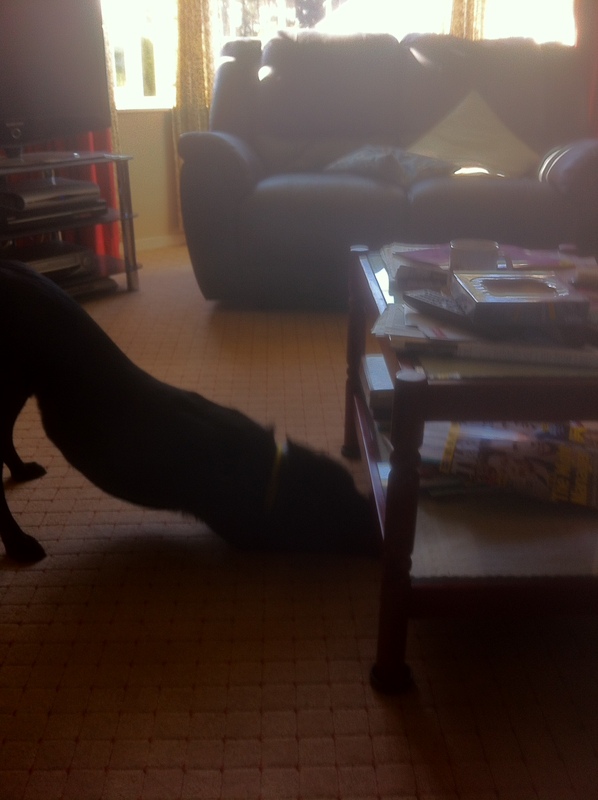 I have taught Him a new trick. After we have played ball for a while he holds up some fingers and says “three”. Next time he holds up more-than-one fingers and says “two”. On the next time he holds up one finger and says “one – last time”. I try not to take the ball back that time. I go for a walk round the garden or have a snooze in my bed. This afternoon He went to the shop WITHOUT ME!!!!!! He left me alone in the garden for – oh, it must have been more-than-more-than-more-than … lots of minutes. I shouted, I howled. I am sure He could hear me all the way to the shops. He said we could play kick-fetch when He came back, but when after lots of barks and howls He did come back I could smell He had some crunchy-dead-animal with Him so I jumped all over Him and did not want to play kick-ball at all. Success! Last night when my Humans turned the dark on They went to Their snoring-room without moving my bed upstairs. I went up to check more-than-one times that They were not frightened without me, but I spent most of the night curled up in my bed downstairs. I found a nice-smelling piece of wrap-food-up in the basket in the corner, but when I took it out there was nothing in it. Today we went for a long walk to what Mummy Chrissy calls “The Yard”. I met a big animal that Daddy Whiskers calls “a Norse”. 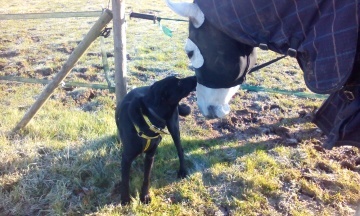 Mummy Chrissy got her picture-toy out while we were saying sniff-hello to each other, but we both moved! He told me in sniff-talk that his name is Cesar. Daddy Whiskers and I played throw-fetch in the field with a red ring thing and it was fun, but if I did not see where it fell I couldn’t find it, even when one time I had a paw through it. I did feel silly. But I was very clever at jumping to catch it. Then we walked home and I spent a long time chewing my crunchy-dead-animal-part. Daddy Whiskers played kick-fetch when I asked him to, but He is still talking funny and barking “wooshump” quite a lot.